The Mississippi River Delta sustains enormous populations of wildlife, has given birth to some of our country’s most distinctive cultures and traditions, and has made possible America’s rise as a global superpower through innovative economic development. But over the last 200 to 300 years, human alterations of the river system have caused the delta to collapse. Since the 1930s, Louisiana has lost about 1,900 square miles of land—land that has disappeared into open water. Recent catastrophes, such as Hurricanes Katrina and Rita and the 2010 Gulf of Mexico Oil Spill, exacerbated the coastal crisis and were also made much worse because of it. 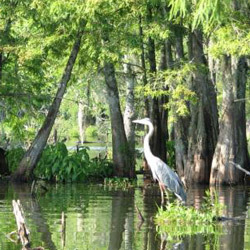 As the delta disappears, so does the natural protection it provides. We need leaders who will be a powerful voice for and a constant reminder of the importance of coastal restoration. Pledge to support leadership on coastal restoration today. I support coastal restoration and believe our representatives should too. Coastal land loss is a critical problem for all of us. Our eroding coast is an environmental and economic crisis that puts our communities, jobs, and way of life at risk. We need elected officials who share this concern and are committed to protecting and restoring our coasts for the people, wildlife, and industries that depend on them.